S-Bahn (suburban) trains operate within most big cities. 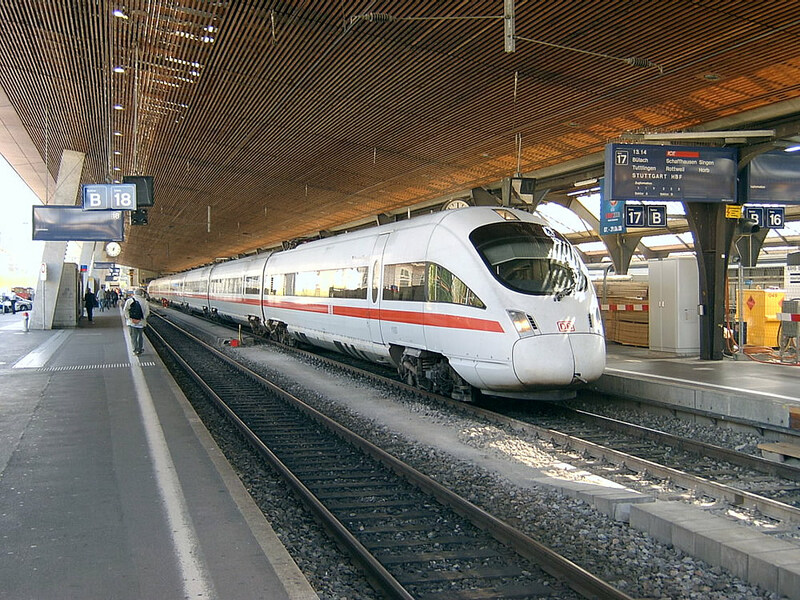 EuroCity connects Zürich, Basel and Geneva to Milan (Italy) and TGV connects Zürich, Basel and Geneva to Paris (France). Zürich Hauptbahnhof (Zürich Hbf) is Switzerland’s largest railway station, being a major railway hub with services across Switzerland and neighbouring countries, including Germany, Italy, Austria, Belgium and France. It is also one of the oldest railway stations in Switzerland and one of the busiest railway stations in the world, handling around 2,900 trains per day, as evidenced by the approach tracks – an early clue of the 7-days a week intensity of train movements. 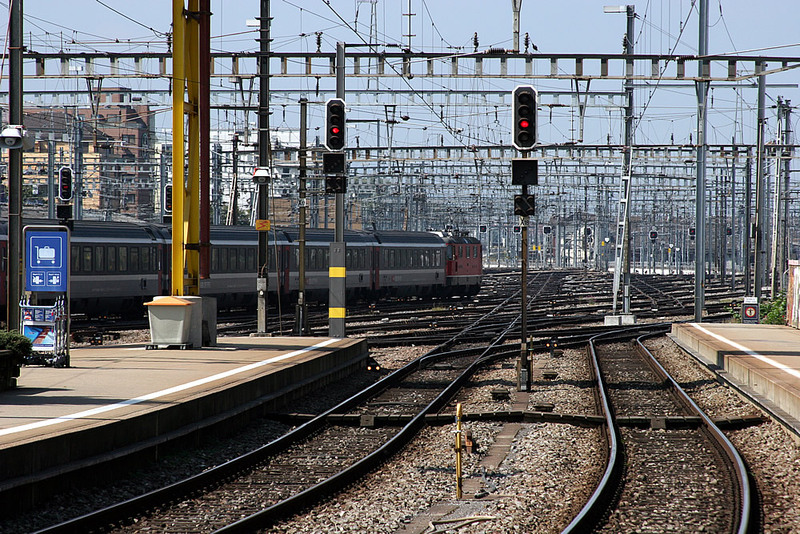 The Zürich Hbf approach tracks give an indication of the number of train movements that have to be managed. 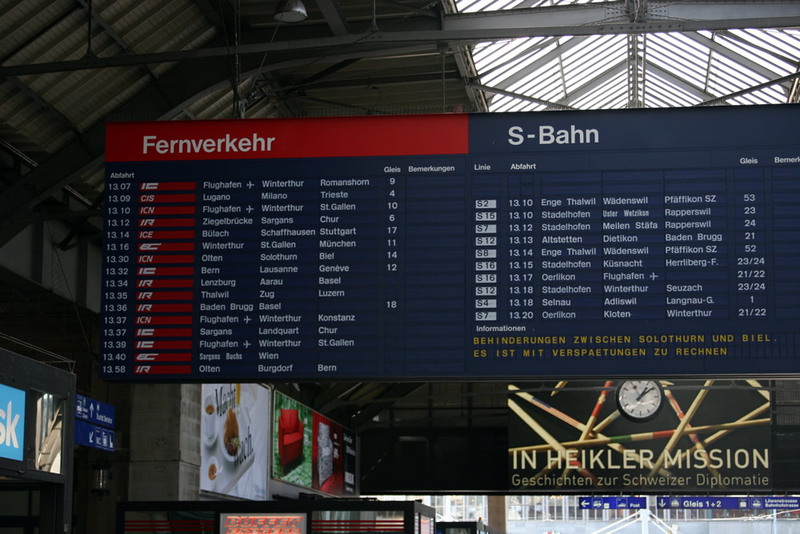 As a major railway hub, with services across Europe, Zürich is one of the busiest railway stations in the world – handling around 2,900 trains per day. 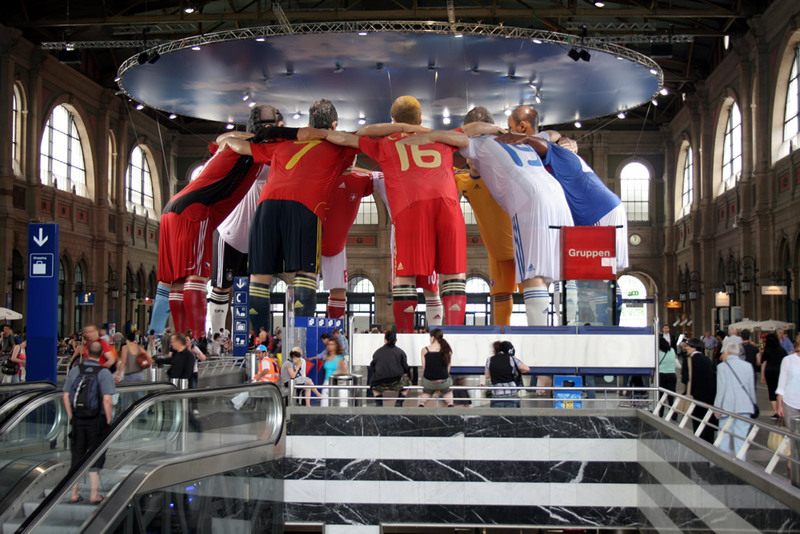 Zürich entertains local, regional and inter city passenger arrivals and departures, together with hi-speed international trains. The following pictures are typical of what can be expected when travelling through Switzerland. SBB provides connections to hundreds of tourist destinations. The Bernese Oberland is a major attraction, particularly the area around Grindelwald, Wengen and Mürren. 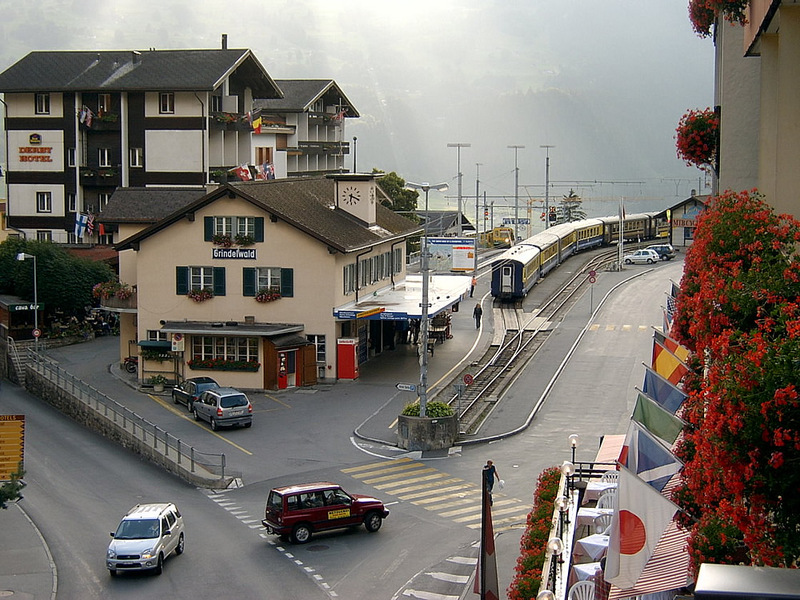 The area is served by the SBB station at Interlaken Ost. The Bernese Oberland is a major attraction and is served by the SBB station at Interlaken Ost, which provides a connection with the Bernese Oberland Bahn (BOB). The picture shows the BOB station in Grindelwald, which conveys passengers onward towards Kleine Schiedegg, located below the magnificent north wall of the Eiger. A few more photographs (click to view in a slide show), including the Schynige Platte region above Wilderswil. View of the Schynige Platte region, above Wilderswil, from Schynige Platte Railway station. Schynige Platte has a rich alpine flora garden and is a starting point for hiking to the Faulhorn – 09.09.2004. Now, onwards to Chur – the capital of the Grisons – and the Rhätische Bahn. The RhB has the largest network of all the private/non-federal railways of Switzerland. The company operates a metre gauge system and provides most of the railway services in Graubünden as the Swiss Federal Railways reaches only a few kilometres, across the cantonal border, to the capital at Chur. 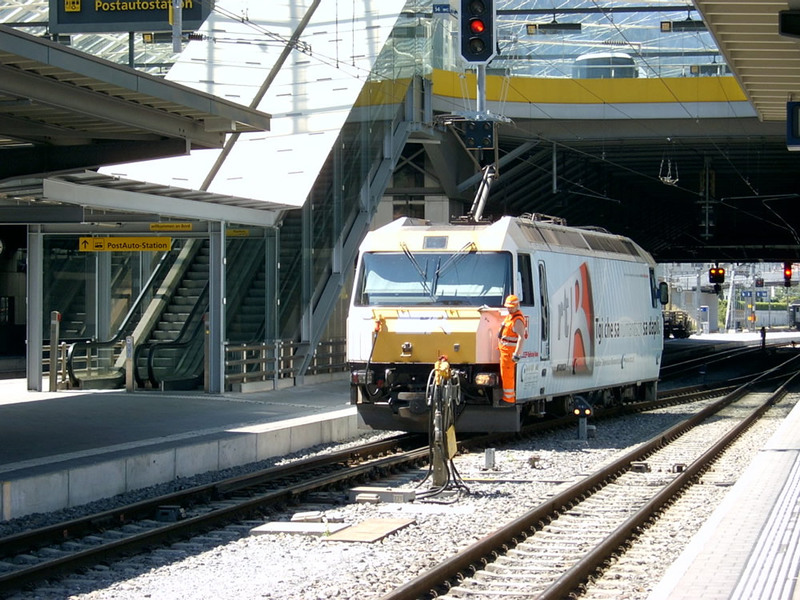 Indeed, Chur station provides the main interchange between the SBB and RhB, having dual-gauge track to facilitate both passenger and freight connections between the metre and standard gauge systems. First, what to expect when you are walking around Chur! The perils of travelling on the right side of the road abroad, as metre gauge Ge 4/4 II, 630 Trun, proceeds through the streets of Chur en route to Arosa? 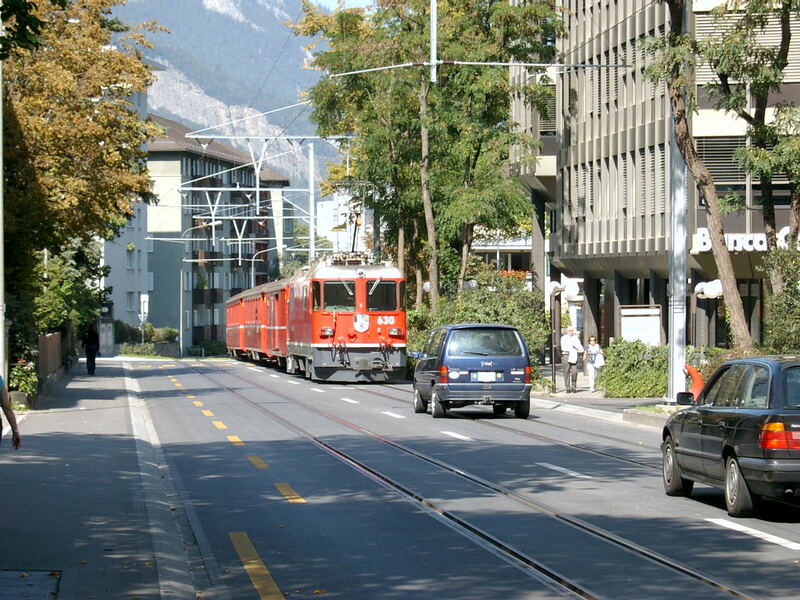 Fortunately, a collision is not imminent – the cars are following the Arosa-bahn train, with the locomotive providing braking force as it travels down towards Bahnhofplatz, in front of Chur’s main station. Chur provides a range of railway travel options – from ordinary carriages to the luxury of the world famous “Glacier Express“. It is in fact, one of the slowest expresses (by design), taking around seven hours to travel through untouched mountain landscapes, glamorous health resorts, deep gorges, delightful valleys, 91 tunnels, and across 291 impressive bridges. A mixed line of modern Glacier Express coaches are about to leave for St. Moritz from Chur 29.06.2008. The slow “express” travels from Zermatt to Davos or St. Moritz in approximately seven hours. 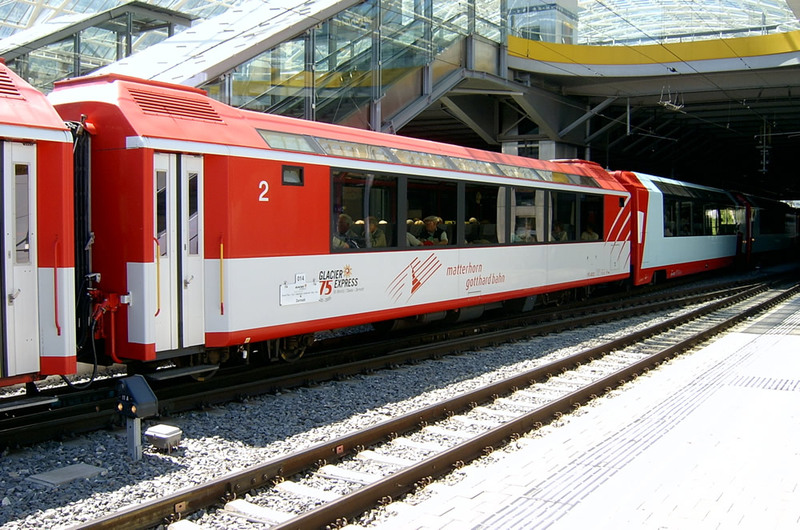 Switzerland is also renowned for its integrated passenger transport system. Ge 4/4 III, 645 Tujetsch, being backed onto the next departure south at Chur – 29.06.2008. The Post Bus interchange can be seen on the station’s upper deck. A mini slide show – four more photographs. The Ge 4/4 II electric has been a reliable locomotive and 621 Felsberg demonstrates its power, without any rack and pinion, at Lüen-Castiel on the Arosa line – 20.09.2007. 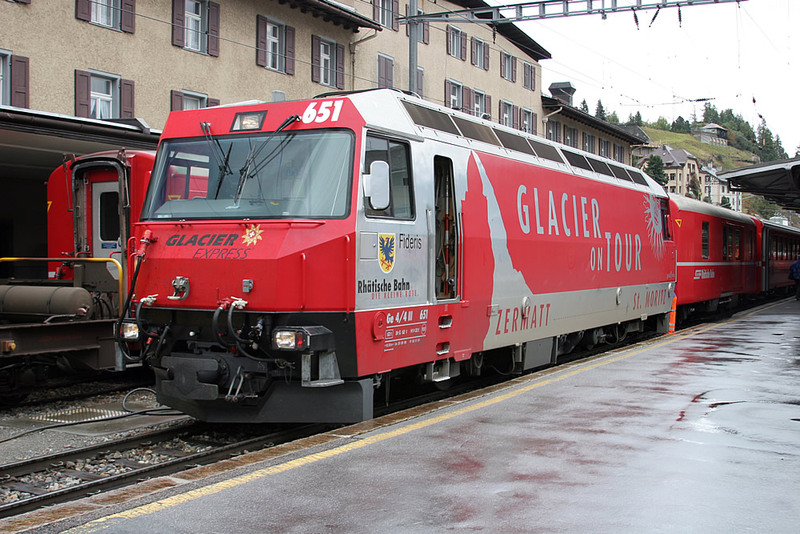 We’ve seen the RhB Glacier Express coaches – now for a bit of the RhB’s grand, heritage luxury. 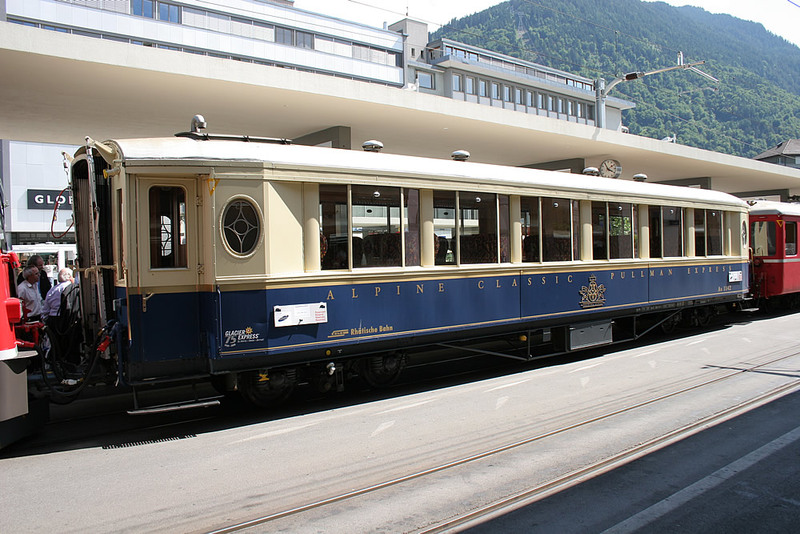 Chur Banhofplatz passengers are about to enjoy the splendour of the RhB’s heritage Alpine Classic Pullman coach attached to the Arosa train – 02.07.2008. More pictures of the Arosa train. St. Moritz is a popular destination for both have’s and have not’s! 4,160 hp Ge 4/4 III, 651 Fideris, has just arrived at St Moritz from Chur, on a wet day in September. The return journey will encounter a sudden snowstorm on the top of the Albula line – 18.09.2007. The journey from Chur to St. Moritz involves negotiating the impressive Albula Line. Don’t worry, the RhB uses it’s powerful 4,160 hp Ge 4/4 III AC electric locomotives – so enjoy! To put them into perspective, the RhB is a narrow gauge railway (1 metre) and yet these 60 ton locomotives are more powerful than many standard gauge locomotives – in the USA, GB and Europe! They also have the benefit of modern bogie design to cope with the tight curves found on the RhB – with self steering radial alignment of the wheel-sets. 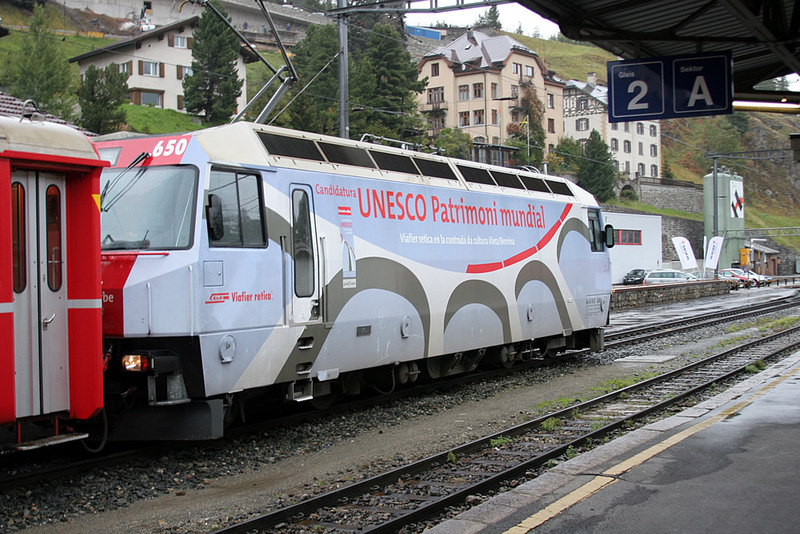 Ge 4/4 III, 650 Seewis im Prättigau, sporting the Unesco World Heritage markings at St Moritz . This 4,160 hp locomotive will shortly encounter the snowstorm on the Albula line! – 18.09.2007. Finally, a last glimpse of what to expect in Switzerland. Well, that’s all for now. I hope you enjoyed the journey. This entry was posted in Railways, Travel and tagged Grisons, locomotive, metre gauge, Railway, RhB, SBB, Switzerland. Bookmark the permalink.